Castle Fraser is the most elaborate Z-plan castle in Scotland and one of the grandest ‘Castles of Mar’. It is located near Kemnay in the Aberdeenshire region of Scotland. The castle stands in over 300 acres (1.2 km2) of landscaped grounds, woodland and farmland which includes a walled kitchen garden of the 19th century. There is archaeological evidence of an older square tower dating from around 1400 or 1500 within the current construction. Originally known as Muchall-in-Mar, construction of the elaborate, five-storey Z-plan castle was begun in 1575 by the 6th Laird of Fraser, Michael Fraser, on the basis of an earlier tower, and was completed in 1636. A panel on the northern side of the castle is signed “I Bel”, believed to be the mark of the master mason John Bell of Midmar, the castle is a joint creation over several decades with another master mason of this period, Thomas Leiper. 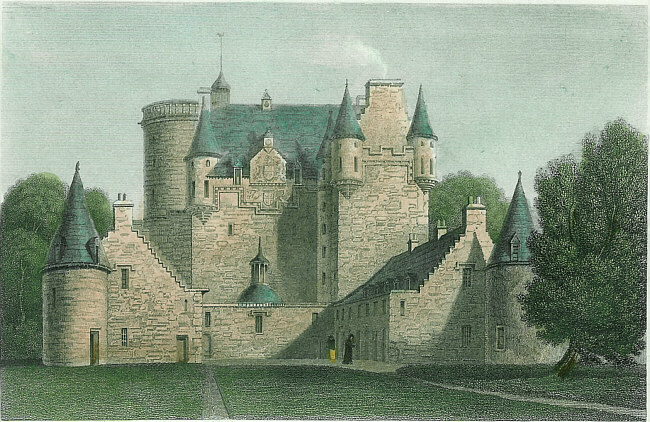 Castle Fraser is contemporary with other nearby castles: Craigievar Castle, Crathes Castle and Midmar Castle which are also believed to have been designed by the Bell family of master masons. The castle was modernised in a classical style in the late 18th century, with a new entrance inserted in the south side and sash windows throughout. This work was supervised by Elyza Fraser, the lady laird. Elyza was also responsible for the landscaping of the grounds, sweeping away the remains of the original formal gardens and orchards, and for the construction of the impressive octagonal stable block. The interiors of the building were entirely reconstructed again between 1820 and 1850, by Charles Fraser, using the architects John Smith and William Burn. The Library is a fine example of John Smith’s regency style with Tudor detailing. Many of William Burn’s more extravagant gothic designs for the most important rooms were not carried out, although a gothic style pipe organ was installed (now removed to Kemnay Church). External works during this period included the construction of the twin gatehouses (still extant), and a grand domed stair and access corridors with loggias in the courtyard (removed). The castle was given a partial ‘restoration’ by the new owners around 1950. The architect and antiquary Dr William Kelly supervised the removal of much 19th-century work to reveal the earlier fabric. 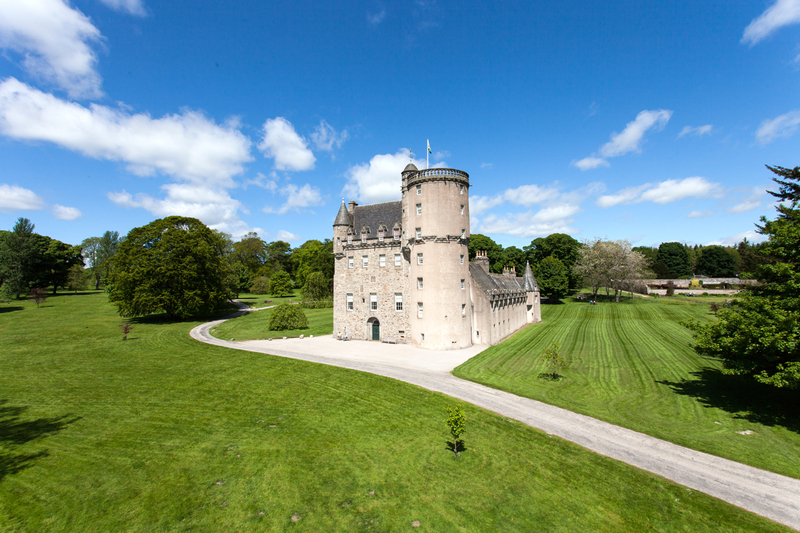 Castle Fraser retains the atmosphere of a family home and still contains the original contents, including Fraser family portraits, furniture and collections. The evocative interiors represent all periods of the castle’s history, from the Medieval stone vaulted Great Hall to the Regency Dining Room. Legend has it that a young princess was once staying at the castle when she was brutally murdered while asleep in the ‘Green Room’. Her body was dragged down the stone stairs, leaving a trail of blood stains. As hard as they tried, the occupants of the castle could not scrub out the stains, and so were forced to cover the steps in wood panelling, which remains today. It is said she still stalks the halls of the castle during the night. It is more likely, however, that the stone stairs were covered to make them easier to climb as they were used as the servants stairs in the 19th century. Some scenes in the 2006 film The Queen, starring Dame Helen Mirren, featured Castle Fraser as a backdrop. A visit to Castle Fraser is a great day out for the whole family. One of the most spectacular of the Castles of Mar, it is the largest, most elaborate Scottish castle built on the ‘Z-plan’ design. The castle has been associated with three remarkable families, two branches of the Frasers and in the twentieth century, the Cowdray family. It is now owned and run by the National Trust for Scotland. The striking simplicity of its Great Hall, along with the stout walls of this handsome building, convincingly takes you back in time. In the Hall you can see part of the ‘Laird’s Lug’, an early bugging device! You can also learn about the castle’s fascinating history. Castle Fraser contains many Fraser family portraits, including one by Raeburn, as well as many fine 19th-century carpets, curtains and bed hangings. The castle stands in 140 hectares of beautiful farmland. You can follow woodland trails, take an unhurried walk through the old walled garden, entertain the children in the adventure playground or simply enjoy a picnic in peaceful surroundings. Round off your visit by relaxing in the tearoom where you can enjoy lunch or home-baked cakes in the ambience of the 19th-century castle kitchen.